Sookie has a murder investigation on her hands. A young girl has died at a vampire party - and it looks as though her lover, Eric, might be responsible. Eric swears he didn't do it, the police don't believe him, and even Sookie isn't so sure. Nor is she inclined to take his word for it, having caught him enjoying the victim's blood minutes before she was killed. But something strange is going on. Why had Sookie been asked to come to the fateful party a few minutes early - just to catch Eric in the act? And why had the victim spiked her blood before approaching Eric? Was it simply because she wanted to be irresistible, or was it something more sinister? 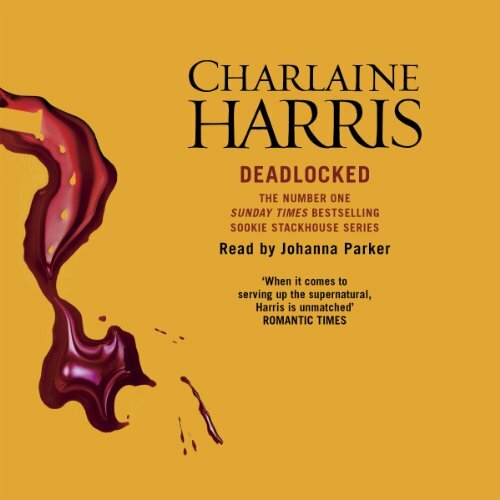 If your hooked in the Sookie-story like me this is a must. What was one of the most memorable moments of Deadlocked? Som realy good Pam-comments and I do like the fearies. Totaly as good as the rest of the books in the series, but it feels a bit like an inbetween book like you are waiting for som realy big event that does not happen, but it does make me look forward to the next one. I am going too cry though if Sookie doesn't end up with Eric in the final book. I really enjoy it when readers with similar reading interests list their favourite authors and series. It really helps me find new authors too follow. Mine are Charlaine Harris, Jeaniene Frost, Jennifer Estep, Faith Hunter, Molly Harper, Ilona Andrews, Kresley Cole, Deborah Harkness, Nalini Singh, Coreene Callahan, Stacia Kane, Kelly Medding and Sherrilyn Kenyon.